Doremisoft Flip Video Converter for Mac is the perfect flip video converter to convert flip video to avi, 3gp, 3g2, mpeg1, mpeg2, mpeg4, mpg, flv, swf, wmv, dv, mov, m4v, mkv etc. It can also extract and convert flip video to mp3, aac, ac3 and more audio formats. this Mac Flip Video Converter is a great flip video software to convert flip video iPhone, iPod, PSP, Apple TV, BlackBerry, Zune, Gphone, Palm, iRiver and a lot more popular players. ...... Doremisoft Flip Video Converter for Mac is also a Mac wonderful flip video conversion tool to convert flip video to Windows Movie Maker, iTunes, and other applications. 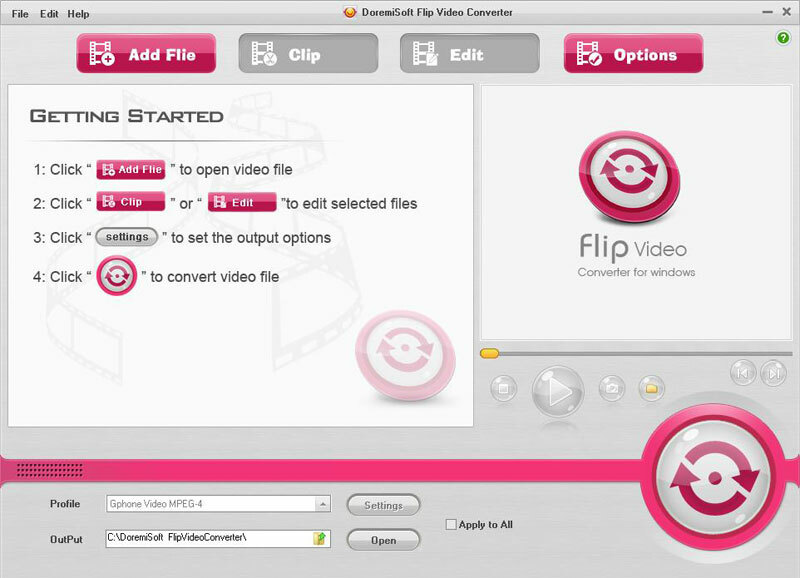 Doremisoft Flip Video Converter for Mac is also an excellent flip video editor. It allows you to easily edit flip videos by cropping flip video, multi-trimming flip video, adjusting video brightness, contract and saturation, merging flip videos into one file and so on. Doremisoft Flip Video Converter for Mac fully supports all flip video camcorders including Flip Ultra, Flip Mino, Flip Ultra HD and Flip Mino HD. This great flip video converter takes care all your needs with your flip videos. Convert flip video to avi, flip video to mp4, convert flip video to mov, convert flip video to 3gp/3g2, mpeg1, mpeg2, mpeg4, flv, swf, mkv, dv, rm/rmvb, wmv, m4v etc. Qweas is providing links to Doremisoft Flip Video Converter for Mac 4.0.1 as a courtesy, and makes no representations regarding Doremisoft Flip Video Converter for Mac or any other applications or any information related thereto. Any questions, complaints or claims regarding this application Doremisoft Flip Video Converter for Mac 4.0.1 must be directed to the appropriate software vendor. You may click the publisher link of Doremisoft Flip Video Converter for Mac on the top of this page to get more details about the vendor.